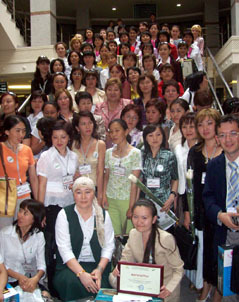 On May 22-23, 2008, the First Forum of Young Librarians of Kazakhstan was held. The Forum was organized by Ministry of Culture and Information of the Republic of Kazakhstan, Library Association of the Republic of Kazakhstan, and National Academic Library of the Republic of Kazakhstan. The Forum idea was supported by such international organizations as UNESCO and IFLA (International Federation of Library Associations and Institutions). They sent their Messages for the Forum where they emphasized significance and topicality of this event. One hundred best representatives of young generation of librarians from 14 oblasts of Kazakhstan took part in the First Forum of Young Librarians. The Forum programme embraced more than 20 various events including work-shops, “round tables”, exhibitions. Winners of competition on library works which was held before the Forum, were awarded with prizes and gifts. The Forum results were reviewed during its closing. In the Forum resolution, paramount task was determined as adoption of “Strategy of Actions of Young Librarians of Kazakhstan 2009-2011” and creation of youth section in the Library Association of the Republic of Kazakhstan. The Forum gave start to new projects of the Library Association of the Republic of Kazakhstan and National Academic Library of the Republic of Kazakhstan – creation of electron data bases “Who Is Who in the Libraries of Kazakhstan”, “100 Young Librarians”, “Successful Projects of the Libraries of Kazakhstan”, as well as edition of new scientific journal on librarianship “Young Science in Librarianship” which will publish the best research works of young librarians.